My Dwarf and Tall Hawaiian Apple [Brazilian] fruit have shown thrip damage to the fruit for all 6 of the years I have grown them. They do not appear to affect the fruit other than visual appearance. I would like to be able to produce fruit with nice clear undamaged skins. 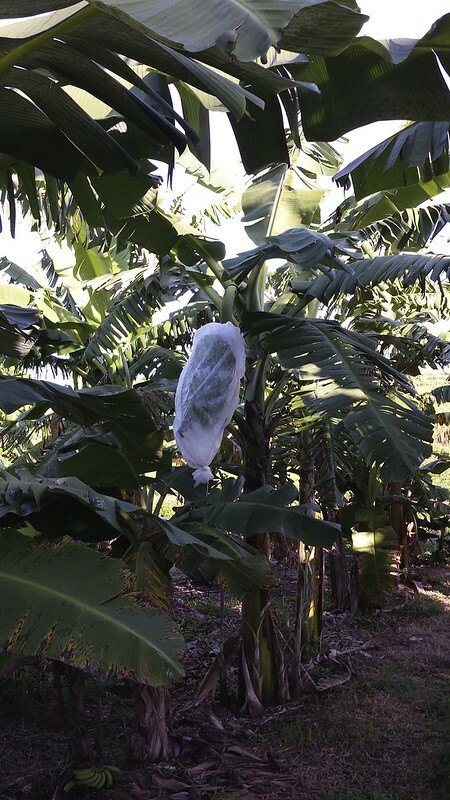 Thrips cannot be controlled with a mild insecticide. You'll need something which lists thrips under "pests controlled". Be sure to apply at the thrip dosage listed in the directions for use. I use Leverage 360. 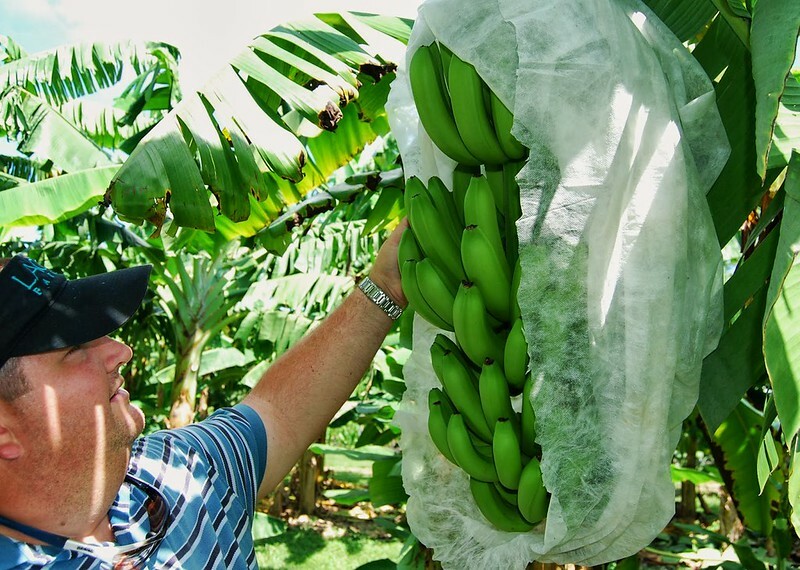 This is the method I use on bananas. Deflower and then put in an agribon bag. You can use spinosad to control thrips as well, but it's an expensive option. Hey Nick, what weight of frost cloth do you use for your bags? Thanks! Last edited by Johnsk9 : 01-20-2019 at 12:13 PM. Sorry for not coming back on this sooner. The aftermath of the eruption has kept me busy trying to bring some order back into life. I have been busy with other projects, but am still thinking and looking around about this off and on. Just not coming up with good solid sounding and feeling controls for the thripes. I do not want to use pesticides, ... period. 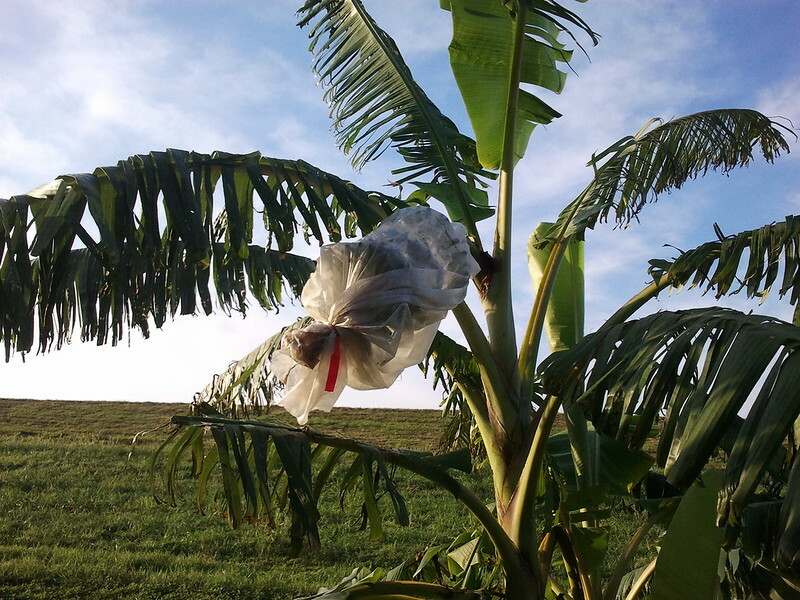 I have seen the blue bags used on fruit growing in median strips in Hilo, not recently, though. I have only been able to find blue bag suppliers in Australia. I have seen the use of white garbage bags recommended. I'm a bit leery of the heavier weight plastic and possible effects. 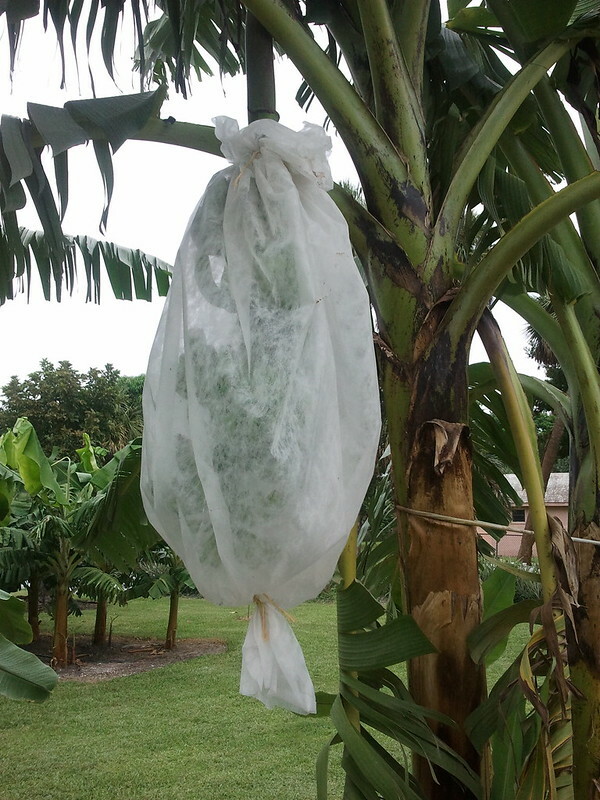 I've seen it recommended that for thripe control the bags need to be applied just after the flower begins developing. 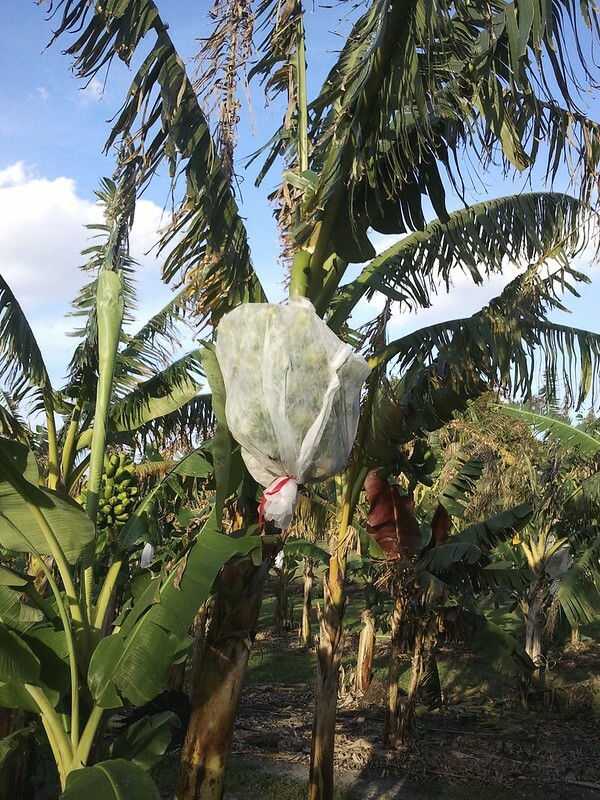 They also say that holes need to be punched into the bags to allow the fruit to breath. I find it hard to believe that will keep thripes off the fruit. The bunches on the dwarf trees are 8 to 10' off the ground. The talls are 12 to 15' off the ground. I just harvested a bunch off a dwarf this morning. Got 4 more coming up in the next several months. 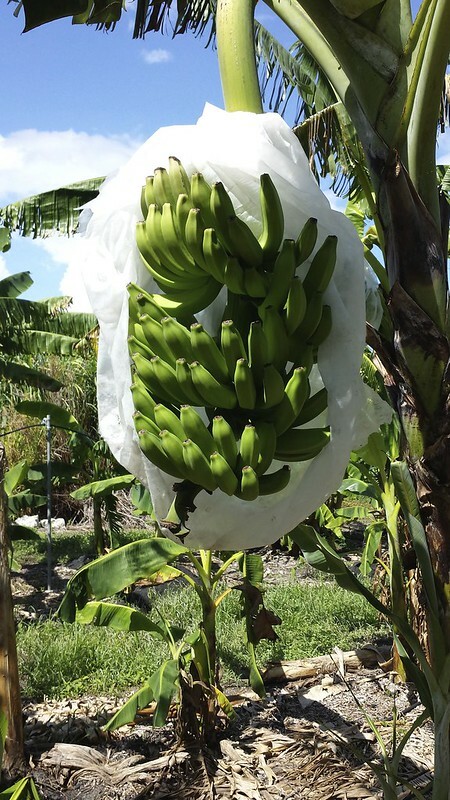 Then, There are about 10 bunches on the talls that will be ready from a few weeks to 5 to 6 months. Bagging the bunches at those heights look to be a PIA, especially the talls. 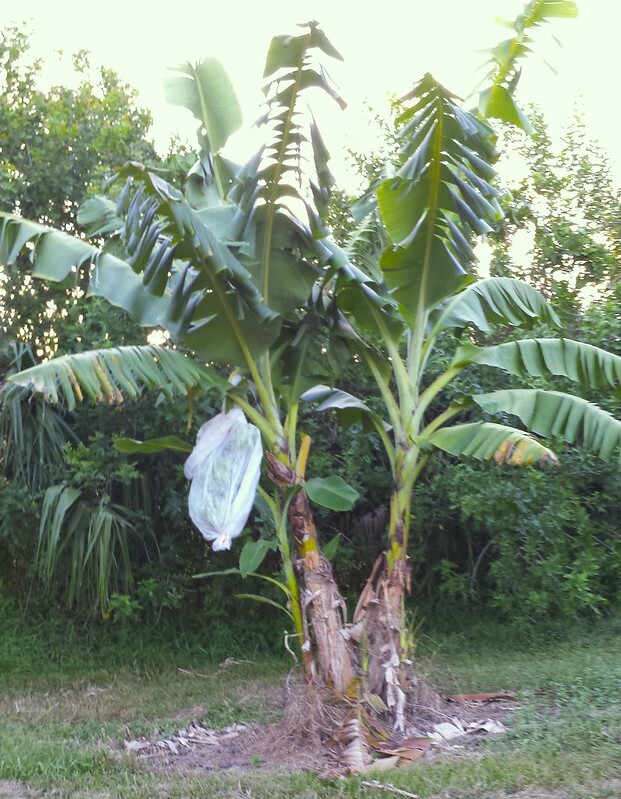 I'm trying to enhance fruit set on all our fruit trees: Banana, avo, citrus, longan, etc. Been laying cardboard under the drip lines and covering it with wood chips to hold grass and weed growth down. After the serious hit all the trees took from the SOx gasses, they're beginning to rebound nicely. 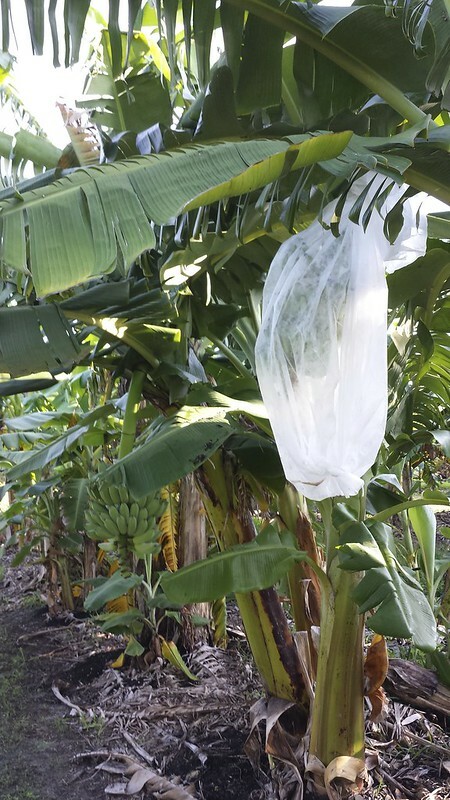 The bananas have 2 to 3 years in their new locations and are becoming nicely established. They're growing the tallest and producing the largest bunches I've seen them do yet. 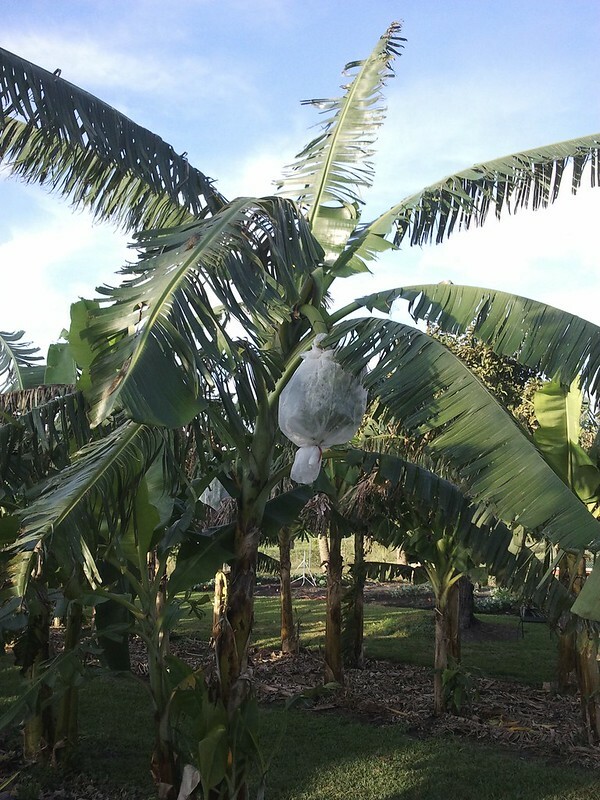 It looks a if we'll have our first banana surplus this coming summer, same for the avos and citrus. We've finally got honeybees and hummingbird moths back pollinating the trees again. There may be life post eruption.